Today marks a momentous occasion that I'm so happy to finally be sharing with you! 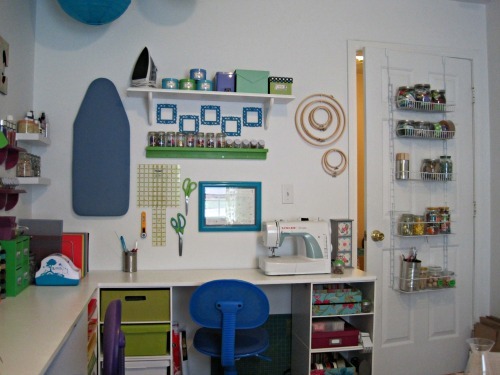 ...Today is my Craft Room Reveal! Finally, right? It's only taken a few years. Or well, I guess...about 7 or 8 years of evolution and work to get to what it is today. 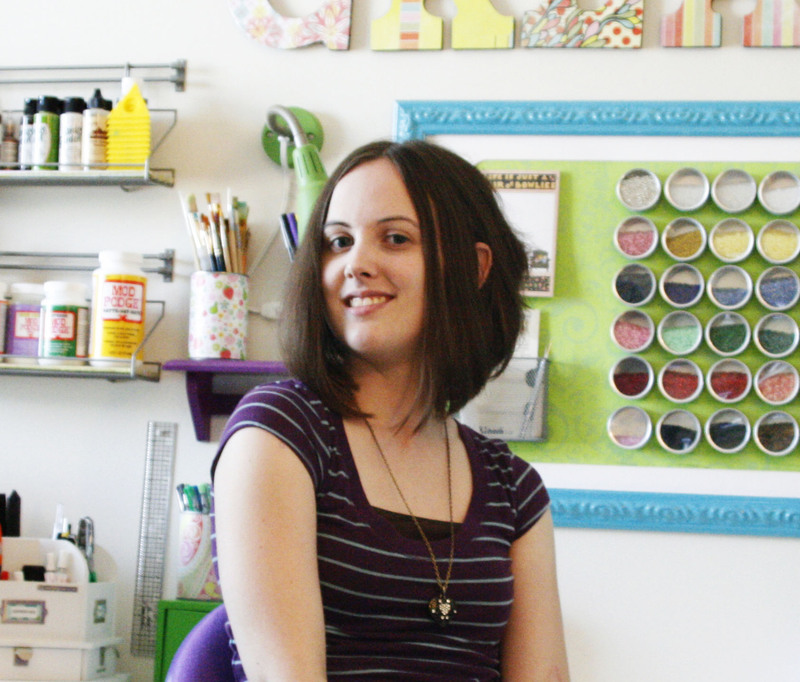 When I first realized that I needed a dedicated space for my craft habit, I was in High School still living at home. 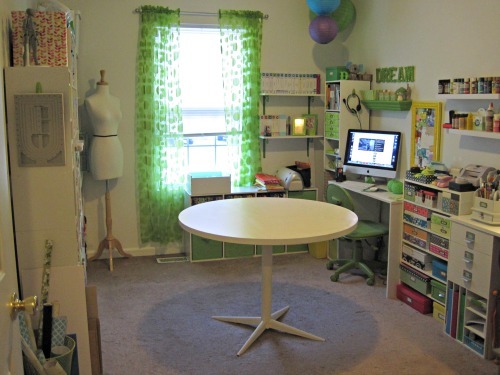 My supplies quickly started overflowing from my bedroom to the spare room my family was loosely using as a dining room, and over time it evolved into my first craft room. Yep. I was young. Don't judge. 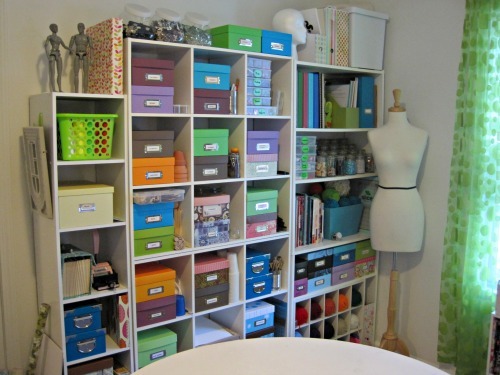 This is where my organizing adventure began. And believe me, it has been an adventure. 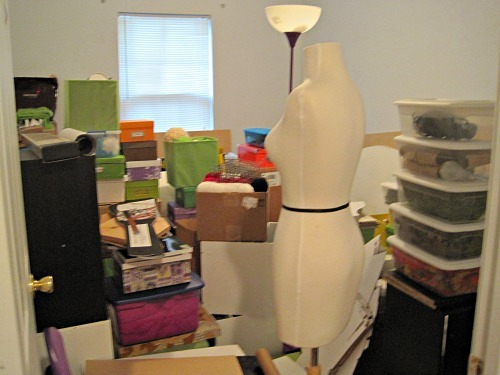 After basically living in a small crafty disaster area, I made plans to move into a two bedroom apartment so that I could use the spare room as my studio space. When I actually moved into my first place, I decided the master bedroom was actually going to need to be used as this space. The smaller bedroom just wasn't going to cut it...and hey, I don't need much room to sleep. A bit better, yes? Functional, but a tad lacking in the personality department. And, the current storage didn't leave much room to expand, which I would undoubtably do. What can I say...I can't help myself. So over the four years I spent in my past place, the space started evolving into what it is now. I couldn't even walk through it when I first moved here back in September. Luckily though, this move was fairly more organized, and it hasn't taken quite a full year to set it up again. Ready to see what it looks like now? Tada! Vast improvement, yes? I'm kind of in love with it right now. Doesn't that white table I refinished look awesome in the space? Can't even tell it used to be orange, and it's a fantastic central work surface! Behind the door I have some storage shelves holding miscellaneous things I don't always need at hand but like to have in clear view in case I need them. Beside the door is my sewing desk. 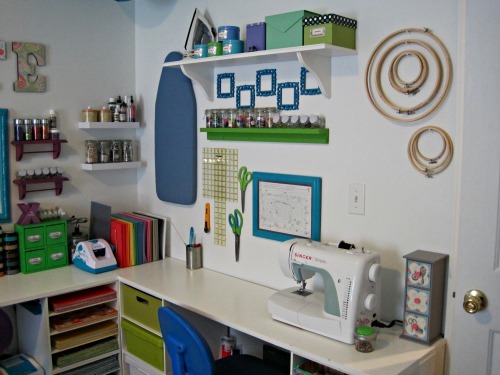 Important things like scissors and pins are on the desktop or wall, along with my embroidery hoops that are kind of frustrating to store other places. 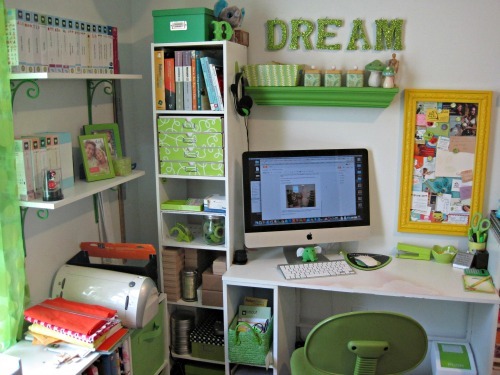 The green shelf I built holds buttons and other small notions and the bigger white shelf holds zippers and other goodies. 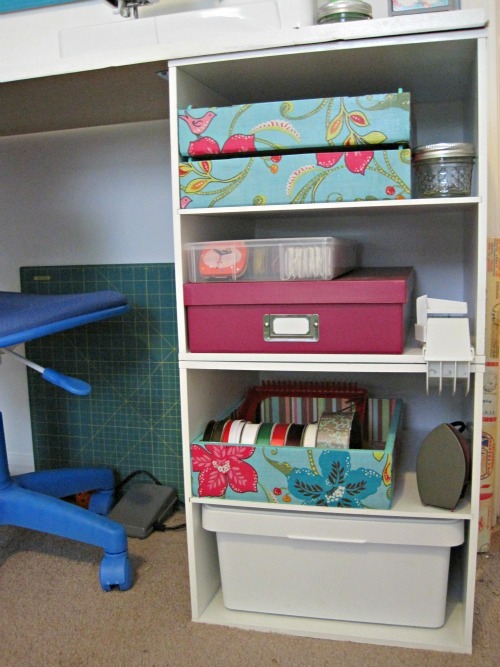 Underneath the desk is where I store other notions, ribbon, and embroidery supplies. My cutting mat stores nicely up against the wall and out of the way until I need it. The other side hold three bins of felt, fleece, and patterns. Continuing to the left we hit my "Create" wall (my "a" is crooked!! OCD Fail...). I work on smaller projects like jewelry on this desk. 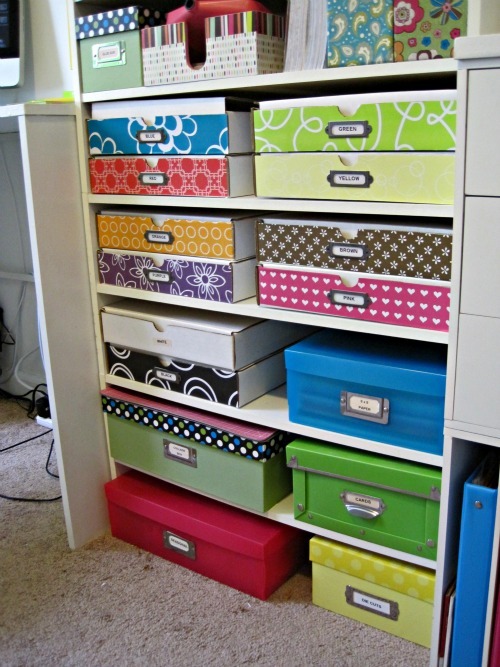 My 8.5 by 11" paper is stored by color in a file organizer in the corner with my Xyron. 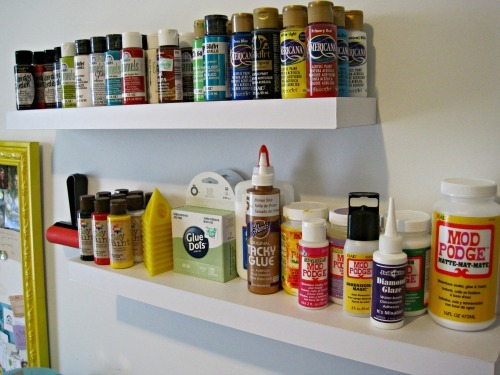 Glitter, paint, and other things I use frequently also live here. 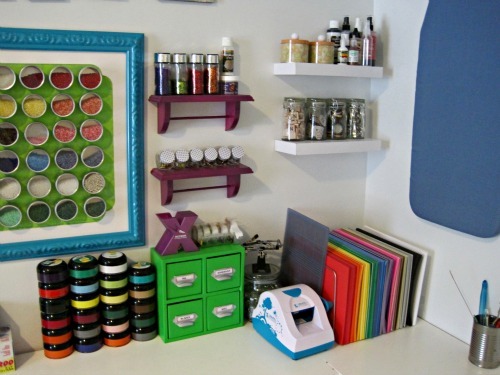 Underneath my bead board (which I'll tell you about in another post) lives my very frequently used supplies such as small bags, magnets, my circle punches, and adhesive roller. This little guy stores my tools, all neatly labeled now. 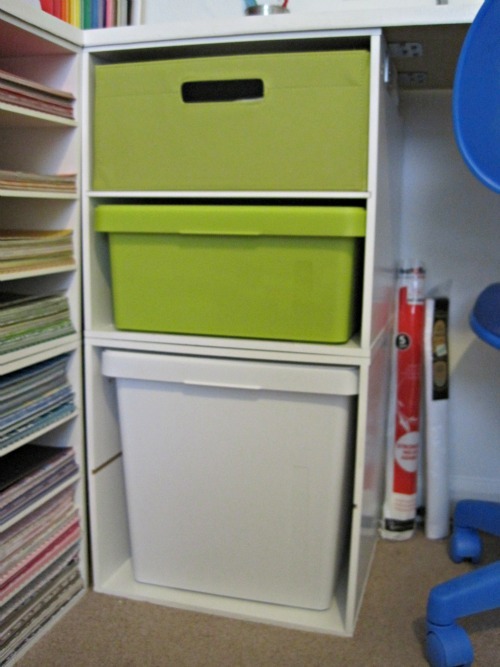 My 12 x 12" papers are stored by color in this organizer under the desk. 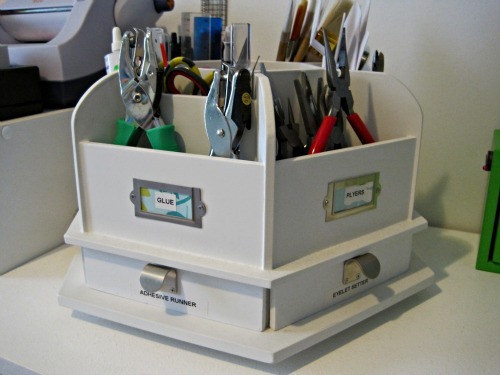 My paper cutters are at easy reach propped up against the side of the desk. 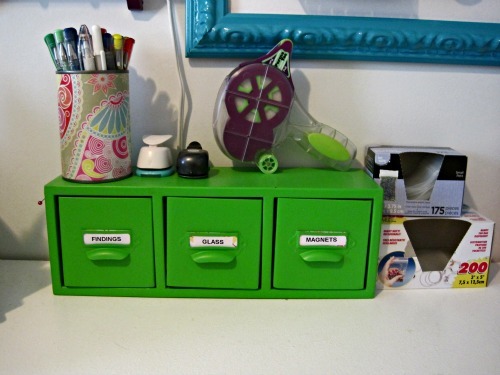 The drawers and the binders I'll tell you about in another post that I'm super excited about. 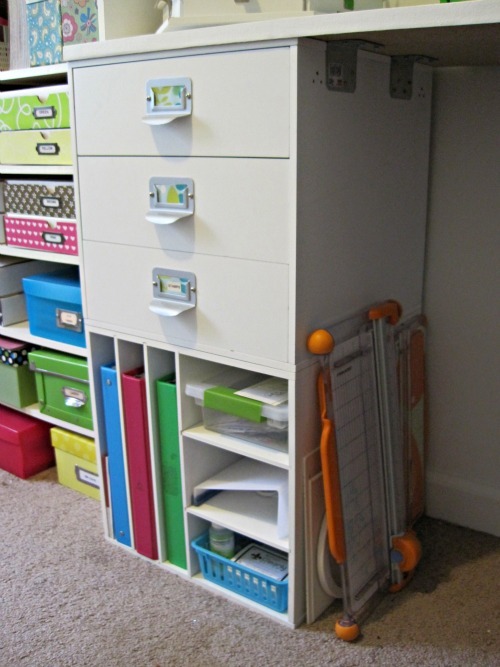 Next to that desk is this unit I made out of closet maid shoe organizers. Here, my scrap paper is organized by color, smaller paper is organized by size and theme, and my self healing cutting mat hangs out on top of my collage box. Above this unit is where my paint and Mod Podge now live. I outgrew the wire paint holder I used previously very very quickly. 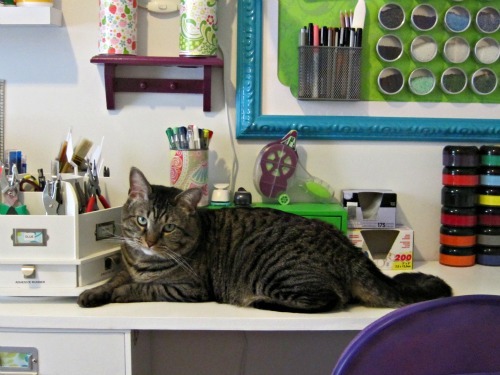 This is my office corner, where I handle everything for Doodleleaf. The shelves to the left hold my Cricut Cartridges. The shelving unit under the window is where all my fabric hangs out. 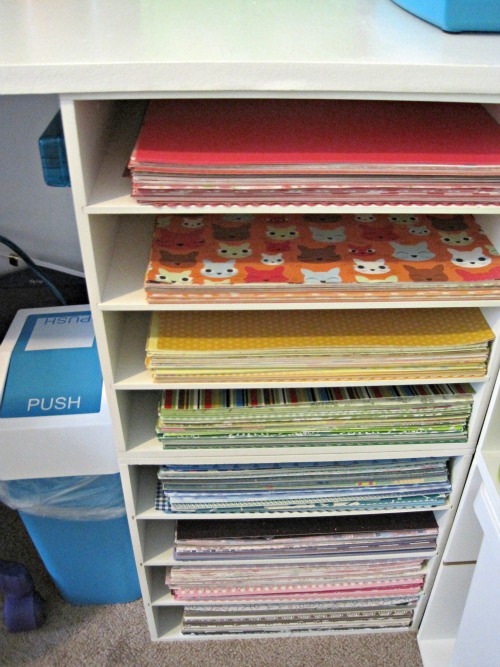 Scraps are in the fabric bins. 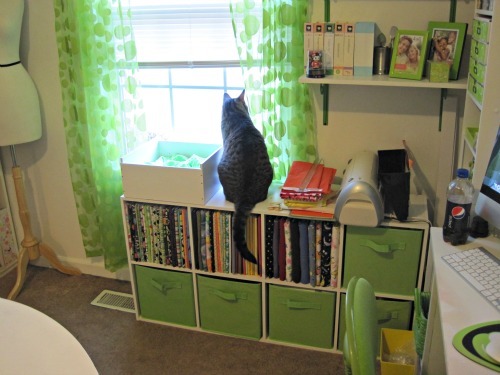 My Cricut (and a small stack of fabric that needs wrapping) sits on top, along with a bed for Marvin so he can look out the window. 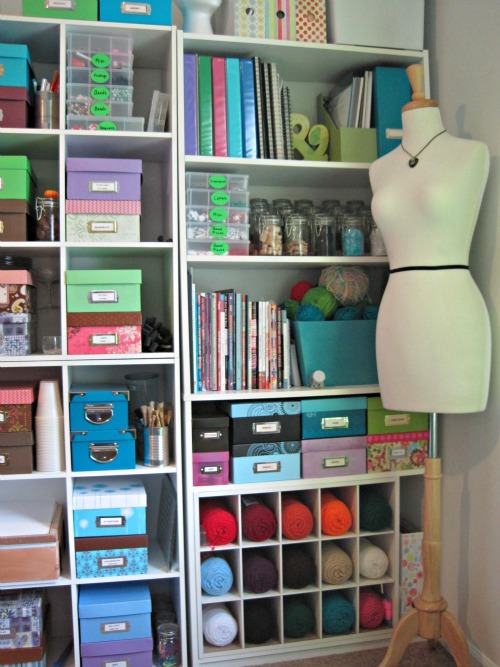 Rosie (my awesome mannequin) has a home next to the window and right beside the epic wall-o-storage. Each craft has a separate box (or boxes...), jar, or place. Here's a full shot of the wall. I love all the colors! I've gotten so much done now that this space is together and organized. It's so nice to finally be marking stuff off the ole' "unfinished projects" list! 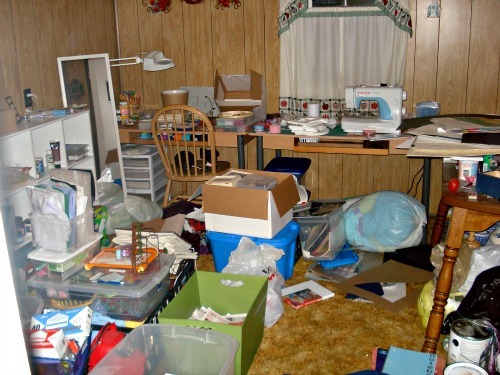 And, I have much less junk lying around! Hoorah! 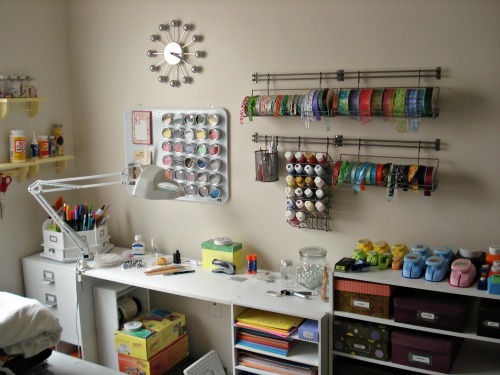 My craft room is an ever evolving entity that grows and changes with me (granted sometimes slowly...) so I don't think it will ever truly be finished. But that's something I really love about it. Even now, I still have a list of projects in the works to make the space even more functional and even more mine (starting with fixing that "a"...) And it's still super exciting! So there it is guys! 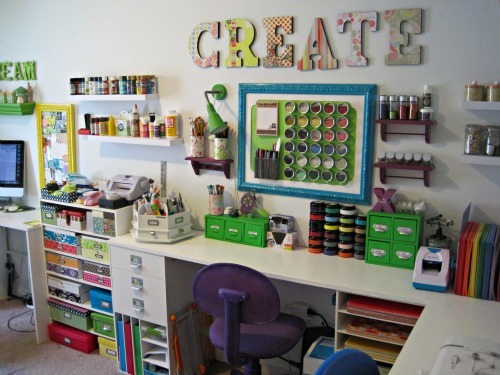 I'd love to hear what you all think of my crafty cave, and any organizing tips that could make it an even better and brighter space!